Andaman and Nicobar are a large group of nearly 600 islands in the Bay of Bengal. Though they are a part of India politically, they are closer to Myanmar and Thailand than to the Indian mainland. It is 1400 km from mainland India (same from Vizag, Chennai and Kolkata) and 1000 km from Thailand. The Andaman and Nicobar Islands are one of the most remote spots on the planet. The original inhabitants are various aboriginal tribes who exist more-or-less out of the mainstream. There are some tribes who have had no contact whatsoever with the rest of the world. Of nearly 600 islands, only 9 are open to foreign tourists, and all of these which are open to tourists are in the Andamans. The Andaman & Nicobar Islands were connected to what is now Indonesia before rising sea levels cut them off. 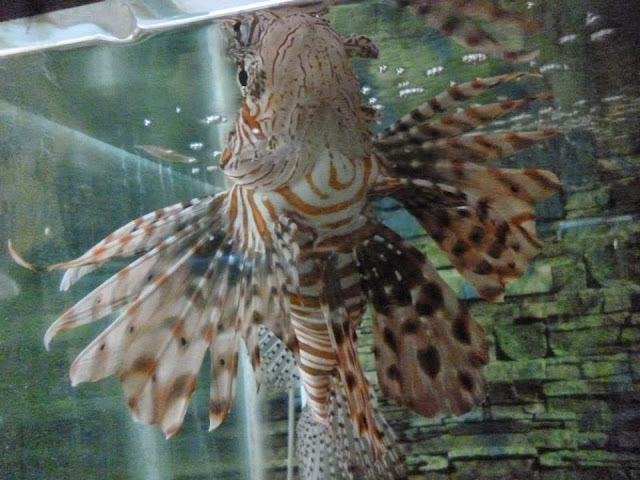 As such, not only are life forms on the isles closer in origin to Indonesian than Indian ones, their geographic isolation has resulted in the creation of several species unique to them. The islands exist in India's popular consciousness mainly because they were used as a penal colony by the British rulers to imprison rebels and freedom fighters, in addition to hardened criminals. Most of the inhabitants of these islands are in fact migrants from the mainland, some of them descended from the prisoners. The Nicobars were badly hit by the resulting tsunami, while the Andamans escaped with a few bruises. The Andaman and Nicobar Islands stretch out almost 500 km in length, with the Andamans in the north and the Nicobars in the south. The main island in Andaman, aptly known as Great Andaman, is divided into 3 portions - North Andaman, Middle Andaman and South Andaman. Port Blair is located on South Andaman. 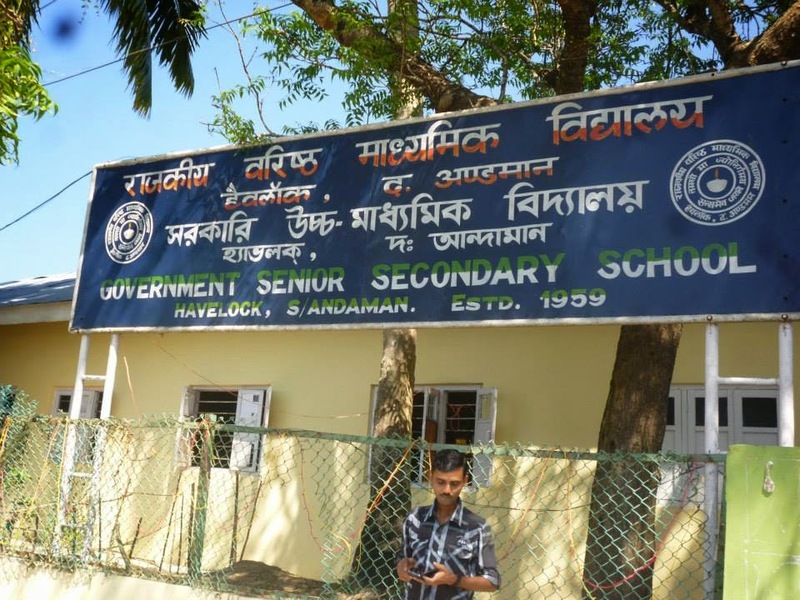 Havelock and Neil Island is on the Eastern side of Port Blair. Normally it its possible to stay at 4 places in A&N. 1. Port Blair - the laid-back capital of the Andamans and the sole entry/exit point. 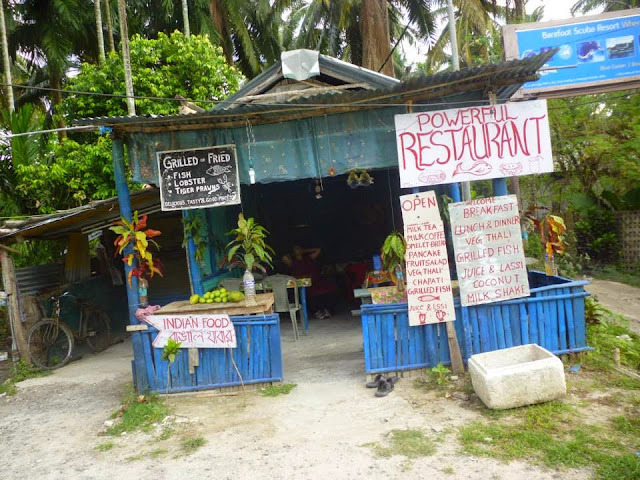 Spend a day or two here walking around and enjoying fresh seafood and seeing a couple of the nearby sites. There is almost no proper beach in PB. It is situated in the South Andaman. Normally do not stay at Central or North Andaman. The jarawas stay here. People normally go there for a package tour to South or North for a day, by bus. 2. Havelock Island, the most visited of the islands with beautiful beaches, great snorkeling and scuba diving. 3. Neil Island, quieter than Havelock with nice beaches and decent snorkeling. 4. 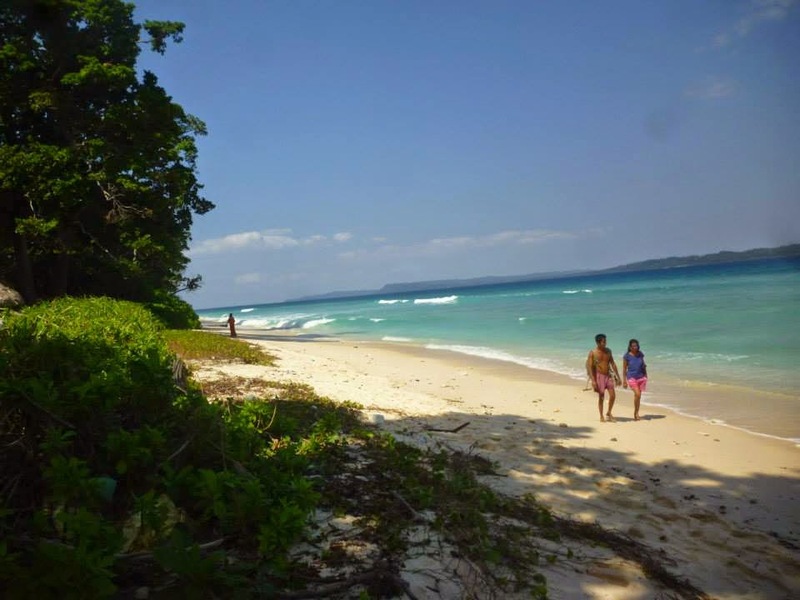 Little Andaman, It has gradually developed as good tourist destination. As per information I had from a foreigner the infrastructure is now reasonably good and much more serene. My friend from Singapore had an accident in this Island. Mid-January until mid-May sees the best weather, and often the best diving conditions. The days are mostly sunny at this time of year and the sea sometimes flat enough to reflect the clouds. The monsoon usually hits around late May, lasting until the end of July, and is probably the worst time to visit the islands – strong winds, frequent rain and low visibility underwater. August through November some occasional showers and slightly rougher seas are possible but diving can still be great at this time of year. The weather often takes a turn for the worse for the month of December through early January. The dominant language in the Andamans is Bengali. In Neil , Havelock and Little Island you can get any with without knowing Hindi ! According to my experience every 9th person is a Bengali in Neil and Havelock. But it is no so in Port Blair. Tamil, Telugu, English and Hindi are widely understood by the inhabitants of the islands that are open to tourism. Mobile phones can be used in many parts of island. and are more or less reliable and stable. They fall under Bengal circle. So we did not have any roaming charge. Internet access on Havelock is extremely slow and unreliable and also expensive. Non-Indians need a Restricted Area Permit to visit the islands, but these are now issued on arrival at the Port Blair airport. If you plan to arrive by sea, you'll need to arrange your permit before arrival, either in Chennai or when applying for your Indian visa. 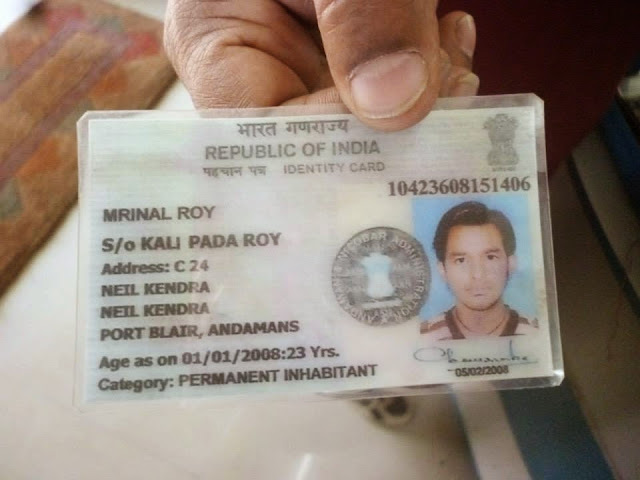 Indian nationals do not require a permit to visit the Andamans. However, permits are required to visit Nicobar Islands and other tribal areas, which are rarely given. Application on a prescribed form may be addressed to the Deputy Commissioner, Andaman District, Port Blair. Andaman’s airport is at Port Blair. it's connected to Chennai, Kolkata and lots of different cities within the country. Flights to Port Blair : The price varies significantly with date, so if your travel dates aren't fixed, you can save significantly by choosing the right day to fly. Port Blair's Vir Savarkar Airport is probably one of the most quaint and idyllic airports in India. There is a scenic view point where the whole airport can be seen. There are no night flights as the airport is handed over to the Indian Air Force after 3pm. · first class Cabin prices Rs. 4,250 for non-islanders and Rs. 1,960 for the islanders. · normal Bunk prices Rs. 1,410 for tourists and Rs. 650 for islanders. · AC Dormitory prices Rs. 2,450 for the tourists and Rs. 1,590 for the islanders. 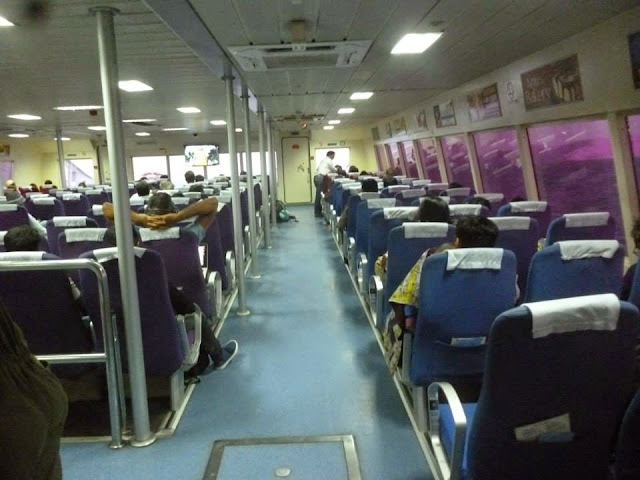 We reached on 23rd April around 1.15 pm, although I booked a hotel in Andaman for the day, on the advice of my friend in Andaman I decided to catch the Catamaran which leaves Portblair at 2 pm . So we took an auto and went straight to catch the boat. All passenger transport in the islands is handled by the government-run Directorate of Shipping Services (DSS), which also runs the ferries back to the mainland. The DSS operates vessels: Rs. 350 one way from Port Blair to Havelock Island. Booking Counter at also available in Havelock at the Jetty and these open at 9:15 to 12:15 and 14:15 to 16:15. You will have to get there early and stand in the queue but as soon as the counter opens the pushing and shoving starts so be prepared to be tough. However locals pay only Rs 40 for the same ride - they have to show a card to avail this facility !! 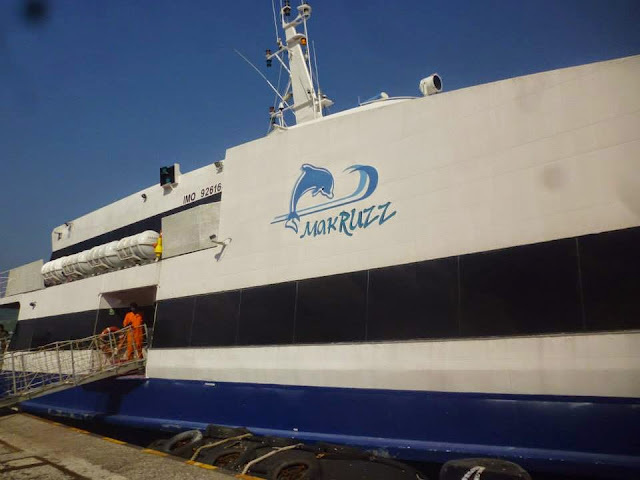 There's a catamaran (Makruzz) ferry from Port Blair to Havelock. Tickets are 975 or above and can be booked from a dedicated ticket booking window at Port Blair or online. In high season demand often exceeds supply, so book your tickets at least one day in advance, either through a travel agent or directly at Port Blair's harbour. As the ferry is more expensive it is less likely to be full, and its schedule meets incoming flights. There is one more catamaran newly introduced. Ferry ticket booking has now been computerised. This means you can book any ferry from any jetty . Services may be changed or cancelled at short notice due to inclement weather, notably cyclones in the Bay of Bengal. The government boat is almost always full and is almost 65% cheaper , but you are forced to travel by Catamran by paying Rs 950. We decided to forego the room rent. This is the wisest decision one can take. In fact I was reading some blogs which are also in this line. But you have to rush to catch the vessel. The other option is to fly in. Pawan Hans, which until 2011 operated sporadic helicopter flights to Havelock, now flies an amphibious 8-seater Cessna seaplane from Port Blair to Havelock and back every day except Sunday. It took around 2 hours to reach Havelock by Catamaran. We got the ticket immediately at the ferry. The Catamaran was almost full. 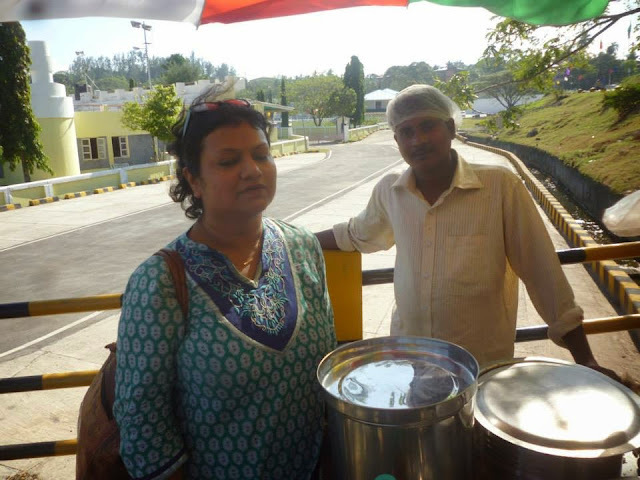 The journey is really nice and there is snacks for sale inside the ferry. After reaching Havelock we hired an auto to search for hotels. There are some bus service also in Havelock, but they are infrequent. When you come out of the jetty there is a junction / fork ( Beach #3 aka Govind Nagar) one road goes towards beach no. 7 (Radhanagar) and other goes towards beach no. 4 , 5 (Vijay Nagar). The beaches have been given a numbering instead of names, although some names like are in popular use. The arrival port is at Beach #1, the junction at the center is Beach #3 (aka Govind Nagar). 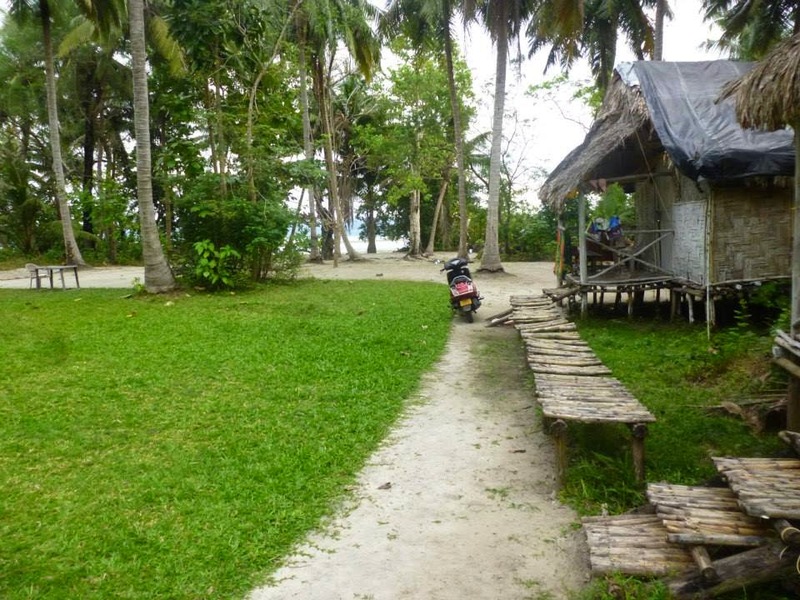 Most accommodation is grouped along the road from Beach #3 to Beach #5. Our auto rickshaw driver took us to the hotels near beach no. 4 on my insistence. On the way we saw some Bengali schools too. Our resort is located just beside the sea and in fact have a private beach. It is run by a person from Delhi taken on lease from a Bengali - who owns the land. It is a palm-thatched beach hut. Prices typically start from Rs 500 and can go upto Rs 1500 depending upon the location etc for this huts. Hotels in Radhanagar beach are more expensive and few and far between. We quickly had some "lunch" quite late at a nearby restaurant owned by a Bengali. The food are quite delicious. After that we walked along the main road to have a feel of the place. Havelock Island is the most visited of the Andaman Islands. It's becoming popular for its beaches, laid back vibe and great scuba diving. Though it's the most visited of the islands it sees only a fraction of the visitors that crowd other island destinations such as Thailand. The pace of life is slow.While many of the lodges have 'resort' in their names, none come even close, thankfully.Mid-January until mid-May sees the best weather, and often the best diving conditions. Havelock island now has many ATMs; SBI and Axis bank. Some of the hotels and resorts are able to perform card transactions. Nevertheless, it is best to make sure you take plenty of cash with you from Port Blair. Ferries are the major way on or off the island. 2-3 arrive daily from Port Blair and one from Rangat , one of which comes via Neil Island. Schedules vary according to day and season, so enquiry locally. · Local buses and shared jeeps ply the 2 main roads between the port (on Beach #1), Radhanagar Beach (Beach #7), and Beach #5 where the bulk of the accommodation is located. There is a local bus for Radhanagar , waiting at beach #1 at around the time the ferry (10-10:30AM) arrives. The journey from Beach #1 to Radhanagar is around 30-45 minutes. However you will rarely get the bus because of the lack of frequency. · Auto-rickshaws are also available. Fares are more or less standardized: from Beach #5 resorts to the market costs Rs.20, from Beach #1 (the port) to Beach #5 Rs 50, and a return trip from the market to Radhanagar Beach (with waiting time) is Rs. 300. · Gearless scooters and motorcycles are available for hire near the center of 'town' (Beach #3), A geared motorcycles are available for Rs 500/-day and gear-less scooters (Honda Activa etc.) for Rs 350/day with a security deposit of around Rs. 650. I was cheated by them - so please write in a paper how much money you have given for security deposit. - I had a huge verbal fight with them. Petrol is available at some of the shops in the market or look out for boards that say "Petrol Pump" (not the typical petrol pump you understand - it looks more like our kerosene. You hire it for 24 hours. Considering the convenience I decided to hire a Kinetic Honda. I was bit skeptical since I have not driven it for last 13 years. The fate of my friend from Singapore is also fresh in my mind. Anyway after some hiccups I managed it quite well. It is surely the best decision I have taken. First I decided to go to Radhanagar Beach (Beach #7) - which is the most beautiful on the island and was rated as the best in Asia by Time in 2004. Gorgeous, silky white sand backed by a forest that provides welcome shade looks out over turquoise water. Sunsets here are often spectacular and it's a popular time to be at the beach. A man with an elephant walks through the forest occasionally, offering rides for a fee. There are a few food shacks where the road hits the beach. Beware of Saltwater Crocodiles from the Sanctuary on neighbouring islands. 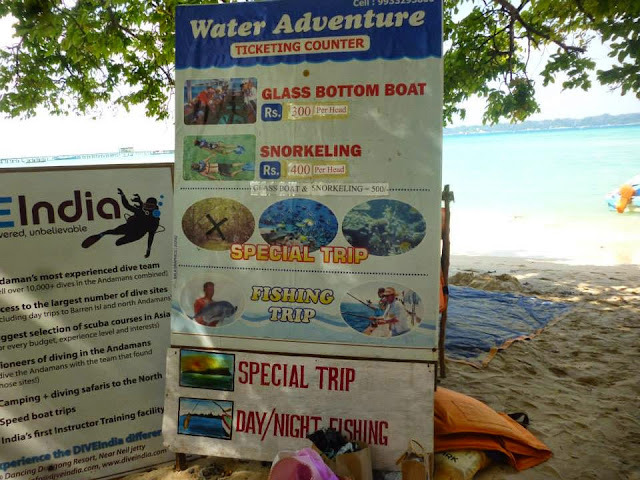 A woman was killed in May 2010 while snorkeling. 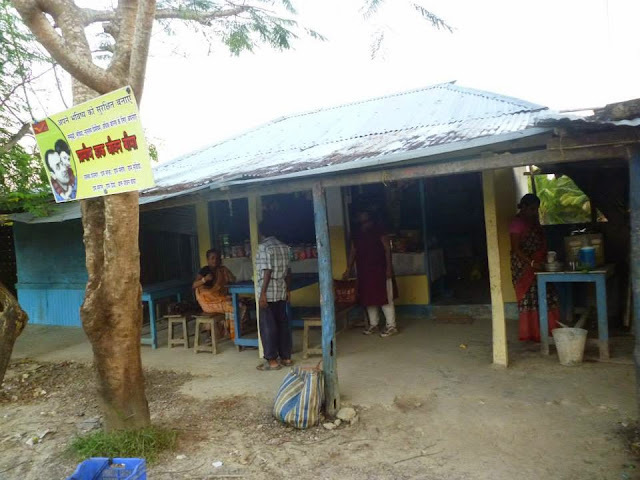 At the shacks near Radhanagar beach there are basic shops selling Andaman & Nicobar T-shirts for Rs.150. I bought one.Take one with black printing, as white text bleeds off the first time you wash it. Fresh coconuts are available near the beach - they are very good - better than the one we have in Kolkata. Today is Saraswati Puja, so we one Puja in a school.We also a poster for celebration of Netaji's birthday. After some time we decided to go our next destination Kalapathar Beach. 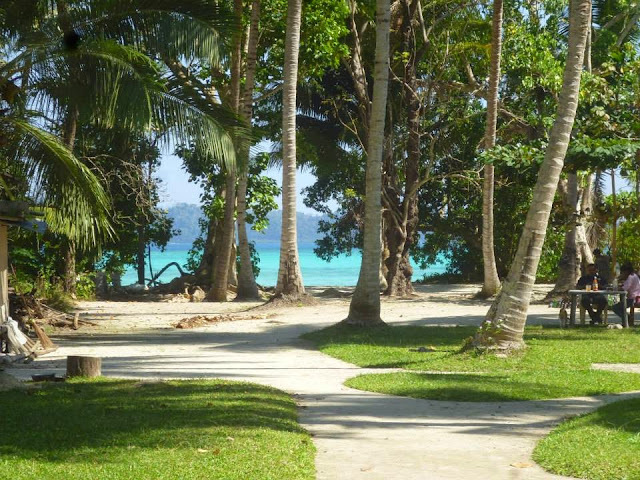 The Kalapathar beach is situated on other corner of Havelock Island - nearer to our resort. You have to travel along the Road From Beach no #3 and Beach no #5 The beach gets its name from the surrounding village called Kalapathar Village and the black rocks (Kalapathar Rocks) that adorn the coastline here. The emerald seas, the tropical forests on one side of the road (Kalapathar Rocks) the coastline,and on other side the silken smooth silver sands and the sheer solitude make this beach a great place to relax. 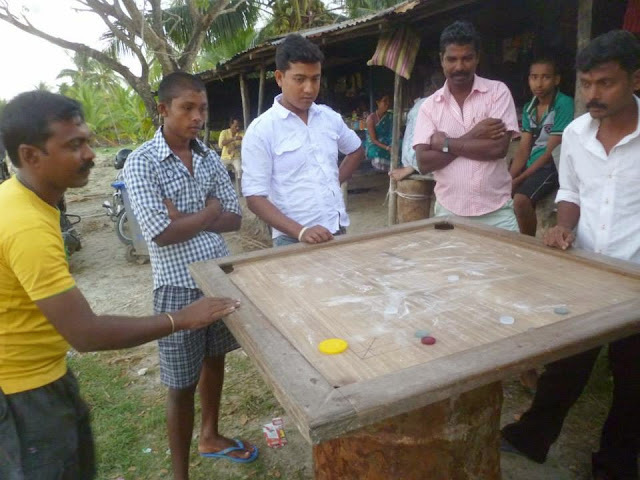 Since we had the conveyance we took some lanes and bumped into some villages and had tea there and talked to them and learnt many things from them.We saw they were playing carrom. We learnt that they were given 40 bighas of land by the Government. "The islands are a good place to live but jobs are hard to come by. Data from the Andaman Employment Exchange shows 6,198 people registered seeking a job. Of those, just 202 got placed. Things have gotten worse in the last ten years. In 2004, between 3,000-4,000 people had registered. Of them, 600-700 found jobs. A woman says her son works as labour with a government contractor. 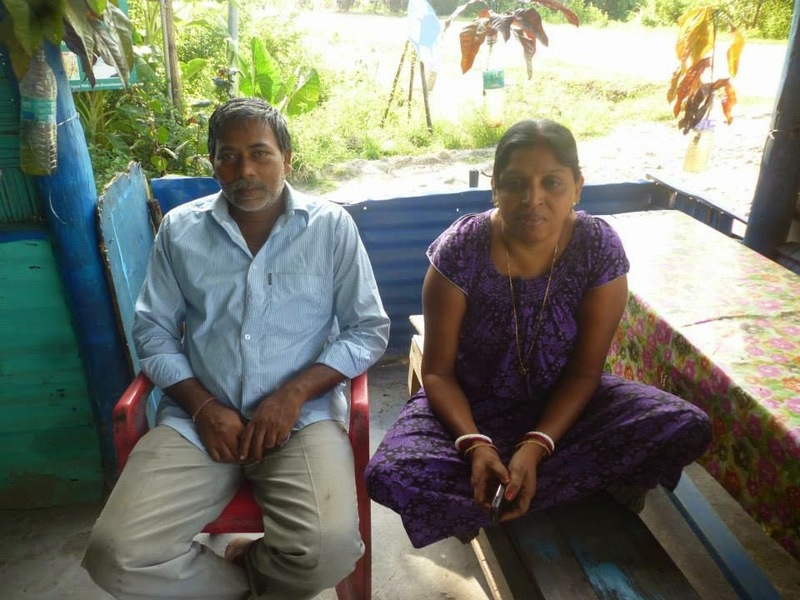 Given the high minimum wage in the islands, he makes about Rs 10,500 a month. "It is not enough," she said. "The only reason people manage is because the government pays for education, books, rations." Former Planning Commission member Abhijit Sen says, State is always generous to its peripheral parts. "Whether Kashmir or the North-East, you will always find a large military presence. And a welfare state accompanies that." Why? "Because they do not quite belong to the mainstream and so the state tries to do all that it can to keep them happy." This has multiple outcomes. One, as he says, corruption accompanies the welfare state. Indeed, the local administration has a reputation for venality. Two, the islands have a better standard of living than the mainland — on indices like infant mortality and malnutrition, they score better than the battered old mainland. This has resulted in mainlanders moving to the islands. In the mid-1980s, the Island Development Authority (IDA), a part of the erstwhile Planning Commission, pegged the islands' carrying capacity at 450,000. (The number of people they could support given the available water and cropland). 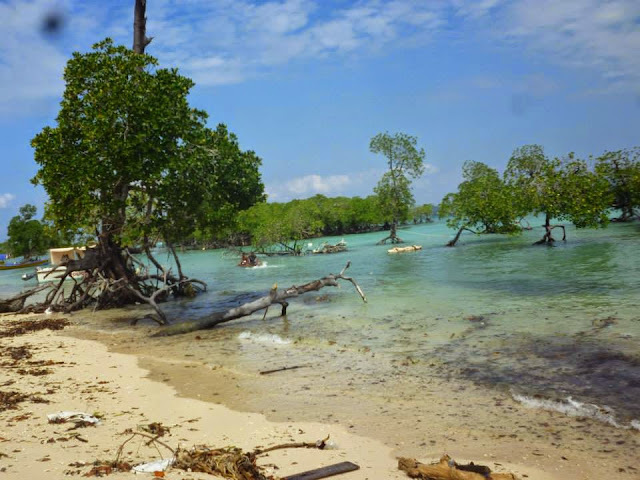 In the islands, the impacts of overpopulation show up clearly in the matter of water. In 2002, for instance, for two months during the summer, families in the isles got 6-8 buckets of water — once every three days. In 2012, Tarun Vijay of the BJP created a minor stir when he said locals were getting 30 minutes of water in a week during the summer. Acharya identifies another factor pushing the islands into trouble. The settlers and the administration are living on the islands the way they did on the mainland. And the islands, more fragile, are buckling. A master plan for Port Blair says the city will need 59 MLD (million litres/day) of water by 2030. Its current supply is 25.7 MLD. The report proposes new dams and a desalination plant but is silent about rainwater harvesting even though the isles get rain 8 months every year — 3,672 mm in 2013. The 2001 census pegged total population at 356,152. However, in 2004, according to the IDA, the population was actually around 4.8 lakh. At that time, I had turned to the local civil supplies department. In 2001, how many people had their names on ration cards? About 370,000, it said. Even today, it is unclear what the population of the islands is. According to the 2011 census, 380,581 people live on the islands — an increase of 24,000 in 10 years. 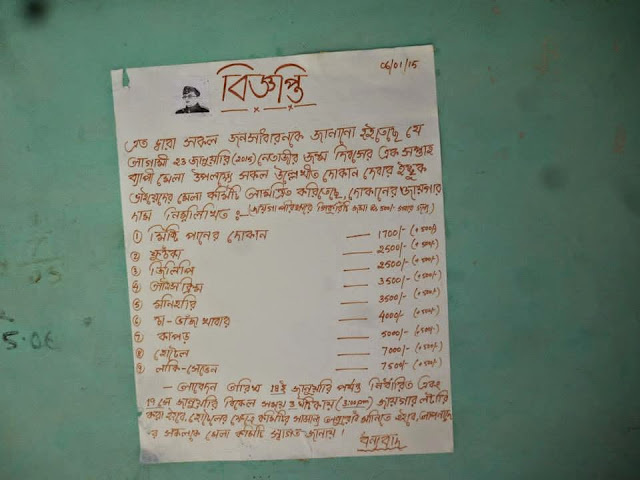 According to the civil supplies department, 388,524 people have their names in ration cards — in 2014. If correct, the actual population could be higher. Defence personnel stationed on the islands do not get ration cards. Also, the cards are given only to those migrants who prove they surrendered their ration cards on the mainland. Otherwise, ration cards are issued only to those who have completed 10 years on the islands. "It is very unlikely," says Samir Acharya, a leading local environmentalist, "that a worker coming from the mainland will cancel his ration card before coming — especially if he has family back home." Farmers from the mainland grew paddy even though the soil is unsuitable. 95% of the islands' power is generated by burning diesel — which has to be shipped in from the mainland. A proposal to generate power for Havelock Island by using tidal flows, a businessman in Diglipur tells me, was scrapped midway. Questions to the administration went unanswered. The ATR itself is an instance of the mainland development model. "Where do you have an island system where inter-island travel is not by boats but roads?" asks Acharya. Around 2000, while conducting a survey on the islands' biodiversity, Acharya couldn't find any rice field that was over 25-30 years old. With the soil of their older fields spent, farmers had hacked out new ones from the forest. All this is sowing the stage for (once more) elbowing the indigenous tribes aside. At that workshop in Blair, some of the settlers demanded the Jarawas be resettled in another island. According to them, the concerns of more than a hundred thousand tax-paying, vote-casting members of the public outweigh those of a few aborigines. If the test of a society is how it treats its most vulnerable, then we are not doing well. As things stand, their demand is an uncomfortable echo of what Venkateswar concluded, "The assimilation of the islanders into the mainstream benefits primarily the well-intentioned "outsiders"." The tribes get enmeshed in a way of life which effaces their existing way of life, they get inducted into the swelling ranks of other dispossessed marginals of mainland India." We got down at Kalapathar beach and spent some time there. It soon became dark - we had to return to our resort. Before that we went to the market to buy some stuff with our scooter. Today we had Red snapper and Barracuda for dinner from Powerful restaurant ! They also has bike hiring business. Mosquitoes are a nuisance, particularly at dusk and after rain, and the Andaman Islands are malarial. Use mosquito repellent, wear long sleeves and long trousers in the evening and sleep under a mosquito net. Normally the resorts give net. Sandflies make a great problem while sunbathing. Occasionally they are in a larger number, so longer shirts and trousers will be recommended. Wild dogs can be a problem, especially along the beach at night – people are regularly bitten. You'd be well-advised to carry a stick to scare them off... or a handful of stones. If you plan to be out until sunset or beyond it's a good idea to carry a flashlight (torch). It can get pretty dark, especially if there's no moon out, and the beaches are often backed by dense forest. When we entered our resort after dinner, we saw we are the only Indian in our resort. All the foreigners are sitting with candle light. Like the day we had our breakfast (Pancake) from the same place. 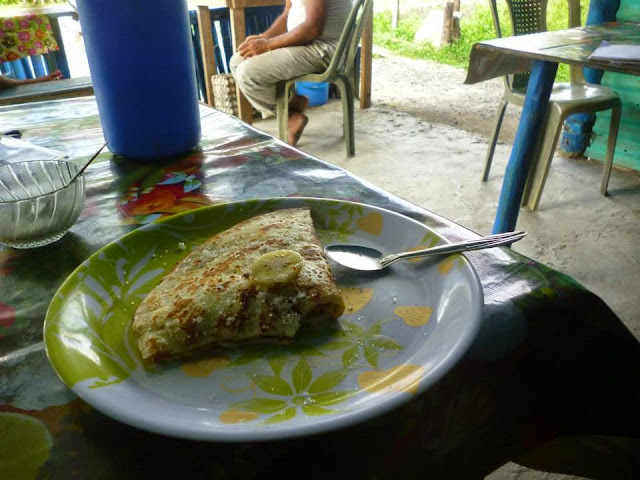 They said (Bengali couple) they learnt the pancake from the foreigners who taught them how to make it entering their kitchen. Today I went to the nearby Barefoot at Havelock Resort. Apparently they have the best resort over there. 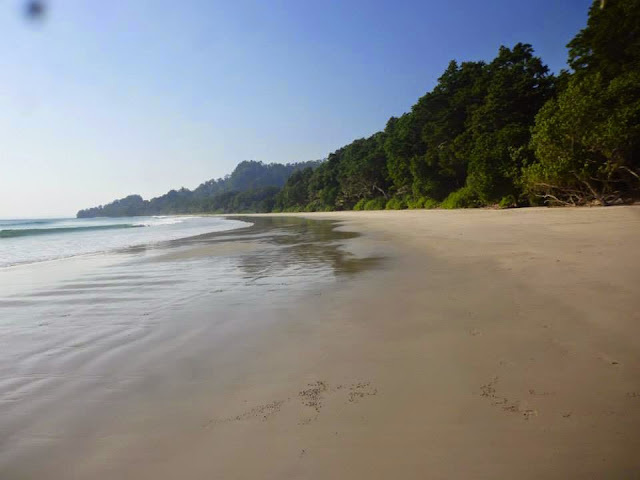 www.barefoot-andaman.com/. The prices are bit scary though by Indian standard. They are the hub of all activities in Havelock. Neil, with its very relaxed vibe and long, deserted beaches is a place to chill out after the "bustle" of Havelock Island. Neil is quite small compared to Havelock. Its widest part is about 5 km in length. You can walk the whole island in about an hour or two. In Neil there have three good sand beaches. Neil Island is really a peaceful island. Till 1967, Neil Island was uninhabited. That year, the first settlers arrived. Given the small size of the island, the administration settled 98 families — about 650 people — there. However, the settlers pulled in relatives from the mainland. Numbers on the island rose. Strangely, while the 2001 Census counted 2,868 people on the islands, the local police outpost estimated the population even higher — at 4,450. According to the 2013 Census, its population now stands at 3,040. Locals, however, peg it at 5,000-6,000. Whichever the correct number, they are living on a land no larger than that capable of housing 650. You can hire a two wheeler for Rs 300 per day. This is the best way to explore the Island as you have the freedom to go to any place at any time. Definitely much more cheaper than hiring a taxi or an auto. Make sure to fill Fuel before 5 in the evening, as you might not find any later. There is a Natural bridge - which is also called Howrah bridge local locally - which we skipped for lack of time. Instead we decided to walk towards right from jetty towards Lakshmanpur beach. It is completely serene and free from tourist . I have never seen such an isolated and beautiful beach. Then we took the road towards right from the jetty. There I saw the snorkelling and other rates quite reasonable. One should definitely stay one day in Neil. There are reasonable number of hotels there. But we had hardly any time left since last ferry will leave soon. We took the catamaran to come back to Havelock. When we returned it is already dark. Today we had dinner at the other restaurant. Today we left for jetty to go to Portblair by Catamaran. it leaves at 9 am. We reached Port Blair at around 11 pm. We hired an auto to go near Aberdeen Bazar. 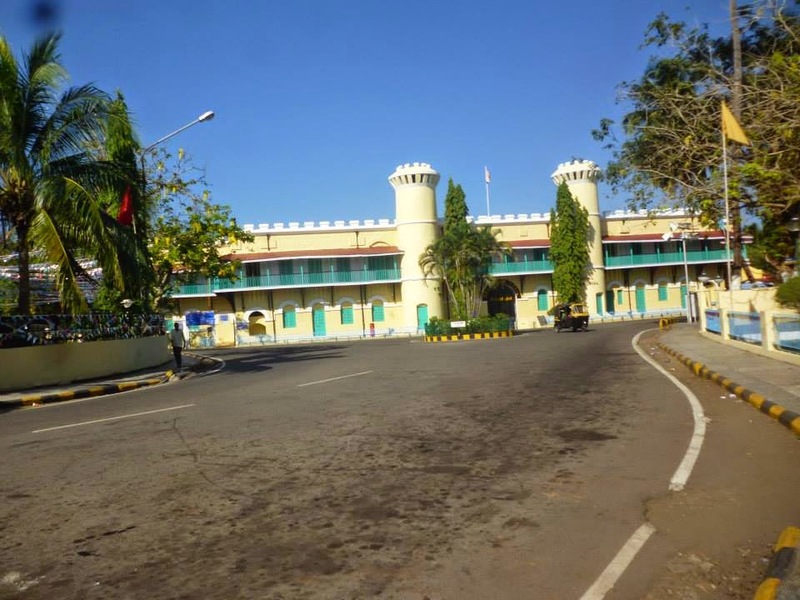 We got a hotel near Lighthouse Residency - though it is very basic , but it has a very good location and actually you can walk to the cellular Jail and we can see the sea. I would most definitely recommend this area to people. 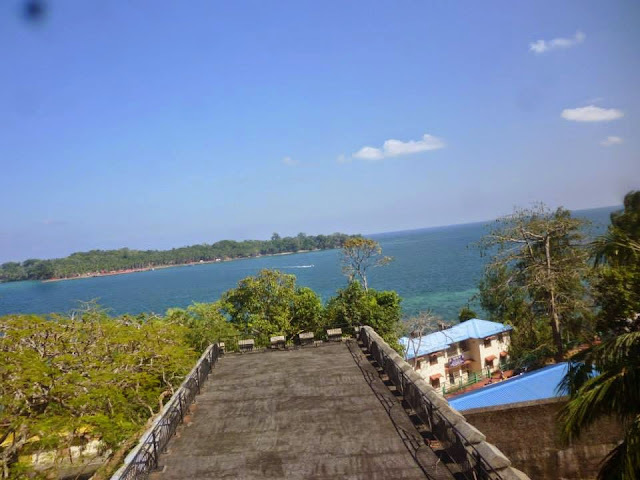 Given the beauty of the rest of the Andamans, Port Blair is a city no different from any other smaller Indian city, but it comprises of people from all over India and one can imagine it as mini India with no conflicts on region and religion. It is one of the cleanest Indian town I’ve seen. 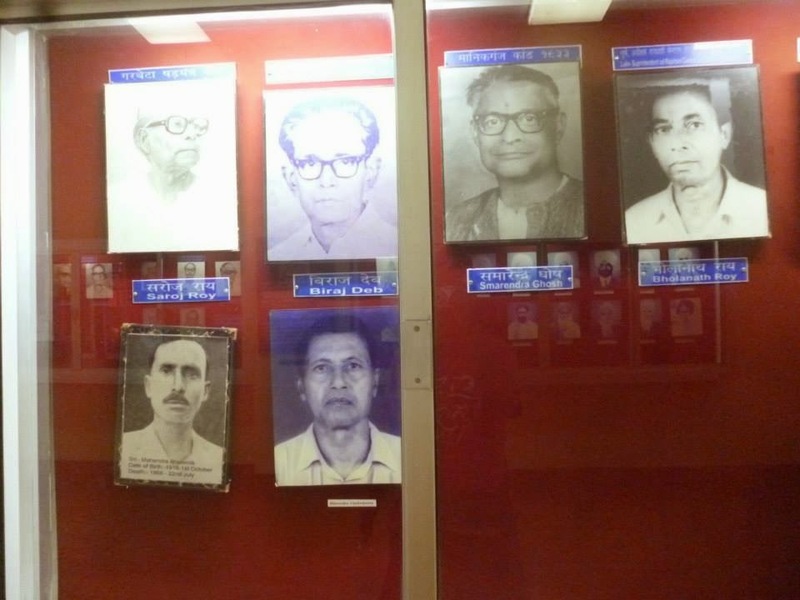 There are less Bengalis in Port Blair. One local Bengali gentleman complained that Bengalis here speak in Hindi so it would be difficult for you to make out if they are Bengali ! First we went to Rajiv Gandhi Water Sports Complex jetty to go to Ross Island. Boat fare is ₹75 for a return journey. It takes approximately 15 minutes by ferry. It is just beside Cellular jail and our hotel walking. Since today is 26th January it is closed ! Once called Paris of the East, Ross Island is where the British stayed in luxury. The island has taken the brunt of the tsunami and saved Port Blair. What remains are walls of buildings that housed the printing press, the water distillery and the church. Caught in dense embrace by roots, they are a photographer’s delight. So we went to the Cellular Jail to buy our ticket for light and sound show. While walking , we met a Bengali Phuchkawala , selling Phuchka - he is from Tollygunge area. He said he is quite happy here. Then we went to Chatam Saw Mill by bus - when we reached there it was closed ! We had some snacks as lunch near the Aberdeen Bazar. Then we went back to Cellular Jail to see the light and sound show. The light and sound show is bound to bring emotion even to an emotion less people. Without any doubt it is worth a watch. We saw the light-and-sound show in Hindi (6 pm) , since the English show will start at 7 pm. In between I met my friend from Andaman Czenne whose forefathers were freedom fighters and were in jail and never went back. Since he was sick and came to visit the hospital nearby we could not meet later. After the show we went to the food stalls near Cellular Jail to have some food. Prices are far more reasonable compared to Havelock. We also went to local curio shop to buy some souvenirs - all within walking distance. We had dinner at Lighhouse near cellular jail - which was recommended by LP. 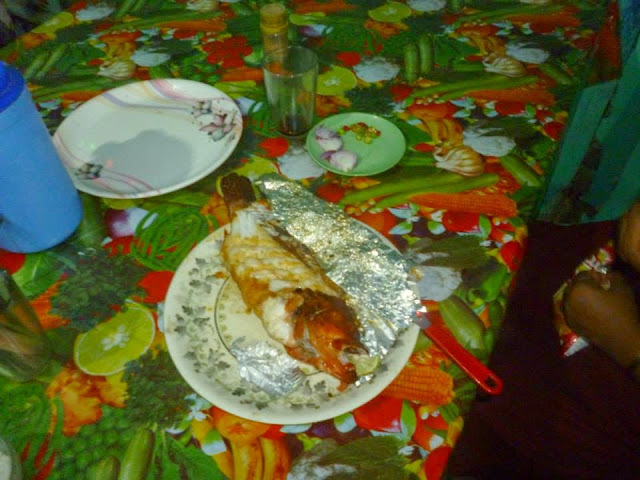 The food was okay - nothing great - but Red snapper price was double the price of Havelock - actually quite expensive. We went to bed little early. Thanks to the early-morning scheduling of most flights and ferries from Port Blair, many hotels have an 8 AM check out policy. So we checked out of our hotel and kept the luggage in the reception. There is some good news for us ! Our Spicejet plane has been rescheduled a later time - so we had more time to see the city. Today in the early morning we left for Chatham Saw Mill, Chatam (15 mins by bus from STS Bus terminal, near Aberdeen Bazar @ Rs 6 per person - on the bus look for Chatham- which is a terminal). 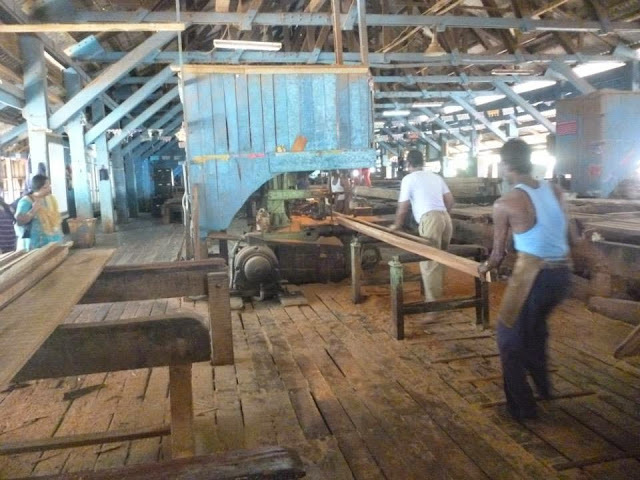 It is the oldest saw mill in Asia. We saw the whole procedure - how woods ready for furniture are made - I found it is interesting. There is a small museum inside the mill. The whole area has a quaint feeling. Before going to the Chatham Saw mill we went to the Chatam jetty- where ships from Calcutta/Chennai loaded with goods enter Port Blair. We had our breakfast here in the jetty. From the jetty passenger jetty is available for going to small Island - Bamboo flat - 10 Rs/person. On the way back by a local bus (basically there are not many bus routes here - any bus which goes to GB Pant Hospital is okay for us !) we got down at Mini Zoo - a bit sad zoo - you will find some animals which are found in the Island. The entry fee is Rs 2. It is located very near Chatham - actually walking distance. We took another bus to go to Samudrika Naval Museum. This is one of the best museums I have seen in India - it has nice display of corals and live fishes. Also has a shop where you can buy local items. It is worth a visit. For lack of time we could not go to Anthropological Museum - which would have completed the lesson in the islands’ indigenous tribal culture. However we had a fair idea of that in Chatham museum and also in Samudrika museum. We wanted to spend more time in Cellular Jail. The Andaman and Nicobar Islands is home to 4 Negrito and 2 Mongoloid tribes. Those belonging to the Negrito origin – the Great Andamanese, the Onge, the Jarawas and the Sentinelese - are still at hunting-gathering stage of economy. They maintain their sovereignty over the island and are hostile towards outsiders. However, as a tourist, you will go nowhere near them, so this is not really an issue. The Mongoloid origin, Nicobarese, has accepted the challenge of change and have prospered and multiplied. The members of the other Mongoloid community, the Shompen, still shy away from outsiders. The Jarawa, Onge, Sentinelese and Great Andamanese are thought to have travelled to the Andaman Islands from Africa up to 60,000 years ago. The first tribe to come into contact with the Indian settlers were the Great Andamanese followed by the Onge and finally the Jarawa. About 40 kilometres to the north of Wandoor — lies the Jarawa Tribal Reserve. 1,028 sq. km in size, it was created to provide a safe habitat for the Jarawas, an indigenous tribe with Negrito origins. 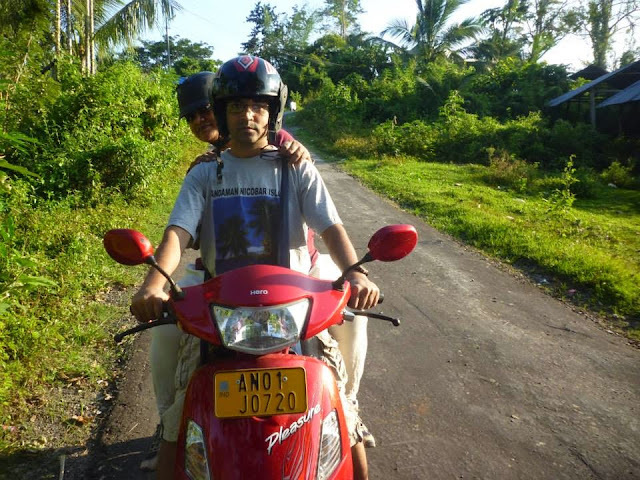 The Andaman Trunk Road (ATR) runs through two parts of the reserve, about 70 kilometres. The ATR, while empty most of the time, is forever rising or falling. There are few flat stretches. We do 32 kilometres and halt at Baratang. 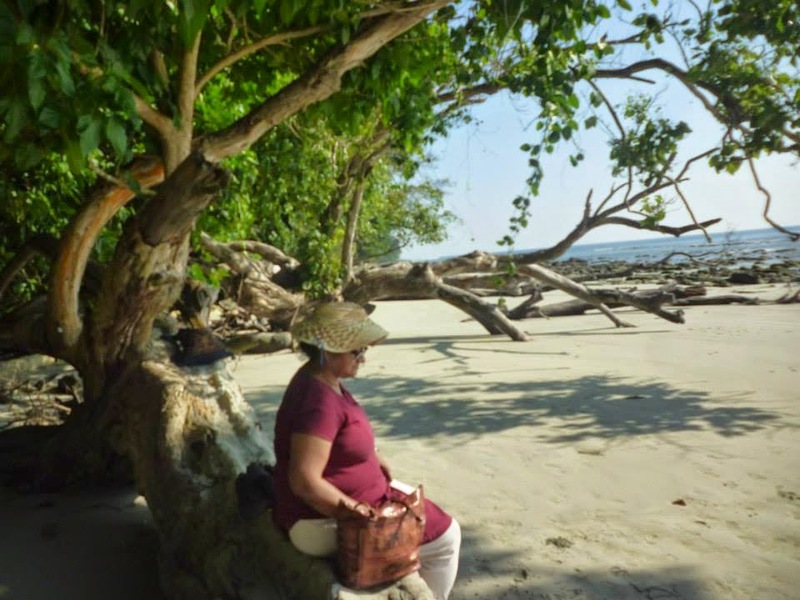 Unlike the jetty at Baratang, which had been crowded with buses and taxis — most filled with tourists crossing the Jarawa Reserve in the hope of seeing them — Uttara Jetty is deserted. Just a couple of trucks shifting diesel. 5 kilometres beyond Uttara is the small town of Kadamtala. Another three km and the Jarawa Reserve starts again. Kadamtala and Uttara are landmarks in the Jarawas' recent history. 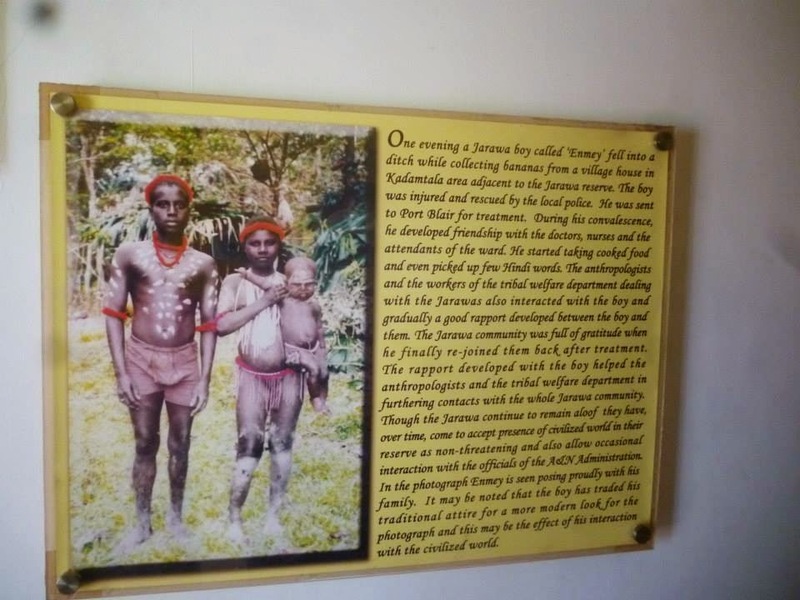 It is near Kadamtala that Enmey, a Jarawa boy, was found by local villagers, with a broken foot. For an administration trying to become friends with the tribe for ages, he was a godsend. He was treated in Port Blair. Driven around in cars. Taught some Hindi. And then dropped close to where he had been found. About a year later, in 1997, Enmey led a group of Jarawas, curious about the world outside their forest, out to Uttara jetty. In the months and years since, many such excursions followed. The development gave fresh impetus to an old debate — should the Jarawas be mainstreamed ? In November, environment minister Prakash Javadekar said in an impromptu address at a rural change workshop: "Don't they have a right to decide what kind of a life they want?" And then, he inadvertently showed the answer was not one that had to come from the Jarawas when he added: "How can we leave them as museum pieces?" Even as this question did the rounds — for over 15 years — the Jarawas were exposed to the worst our society has to offer. Drinking is now endemic. Near the police check-post where the ATR dives into the Reserve, we find a black and yellow ambassador willing to drop us on the other side. All Jarawas, says its driver, are addicted to paan and chewing tobacco. A month before we reached the islands, there was a conference at Port Blair where the state tribal department announced it was providing some education, getting the Jarawas to make artifacts, design clothes they would wear, etc. It is yet to put out detailed information about these activities. There is a need to tread cautiously. In "Development and Ethnocide", anthropologist Sita Venkateswar describes what mainstreaming has meant for two other Andamanese groups — the Onge and the Great Andamanese. She writes, "The programme, as charted by several anthropologists, the eminent geneticist and some idealistic "top" officials, had very little bearing on the reality of its implementation." The implementing instrument was the staff of the Adim Janjati Vikas Samiti. Writes Venkateswar, "Most of the welfare staff manage these settlements as if they were their private fiefdoms. Their lowly, ill-paid status in the hierarchy of government office undermines the lofty ideals attributed to their assigned duties. This means that the general attitude of these "government servants" is to appropriate as much as possible during their tenure and "to hell with the junglees"." In the book, she narrates incidents where the Onge got liquor from the staff, another where an Onge girl was assaulted by a staffer. Further, of abuse. Apart from that, in 2008, 8 Onge men died after drinking what they mistook as alcohol — their population before the incident was about 100. Even if, as she says, the camps were run well, a community's way of life and culture would still be lost. Some years earlier, I recall, the son of Jirake, the king of the Great Andamanese, had been photographed begging in Port Blair. Cellular Jail: Built by the British to house political prisoners far away from the mainland. Briefly taken over by the Japanese during WW2, who added outright torture to the palette. 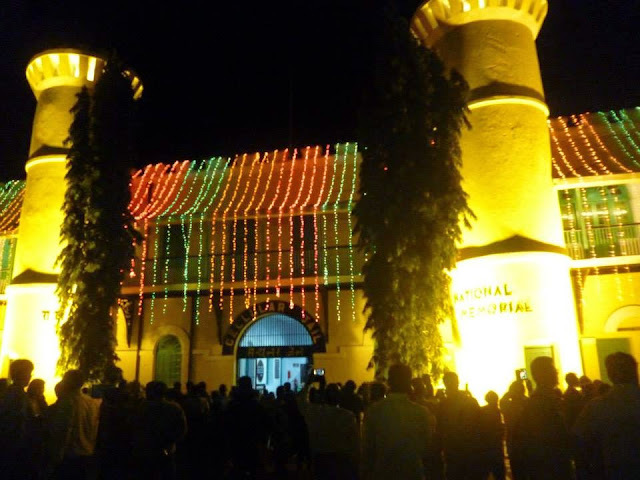 Today, however, the jail has been transformed into an immaculately kept national monument complete with a garden that seems very much at odds with the horror of the place..
Cellular Jail opened a heart-rending chapter on freedom fighters. 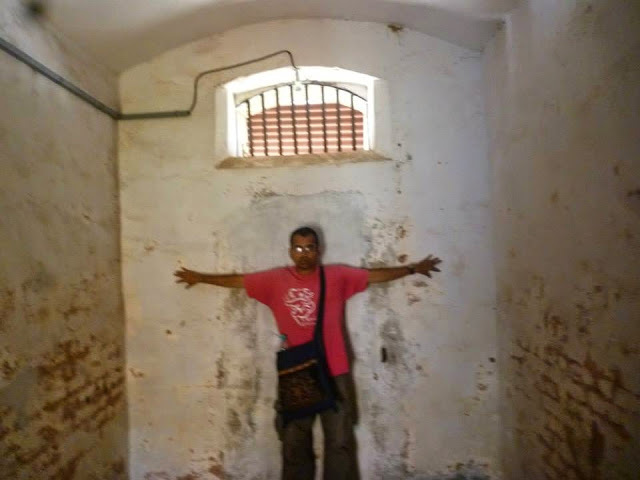 It demands two visits, one for the light-and-sound show in the evening and another in the day for a guided tour of the prison cells, the hanging room and the area where inmates were put to arduous tasks like extracting oil from coconuts and whipped on failing to achieve the steep targets. To ensure insulation, cells of one wing opened to the back of the cells in the adjacent wing. Once the sun set, they were left alone to pitch darkness and thoughts of home across the seas. 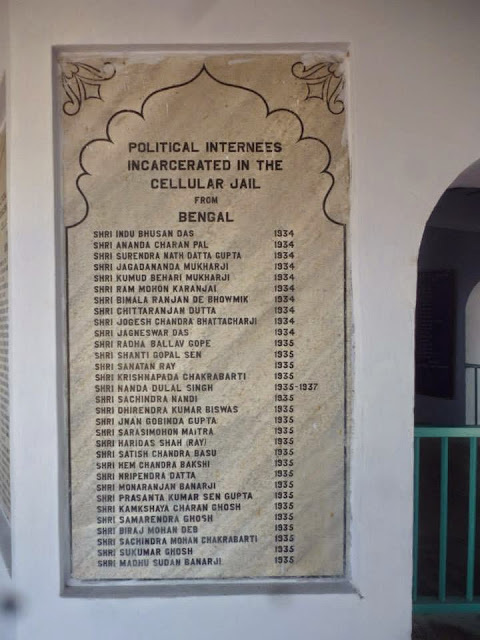 The central columns of each floor now have the names of inmates, most of them from Bengal. The most famous is Veer Savarkar, after whom the airport has been named.In fact I have counted that - out of 10 pillars full of names - 8 are names of Bengalis only. 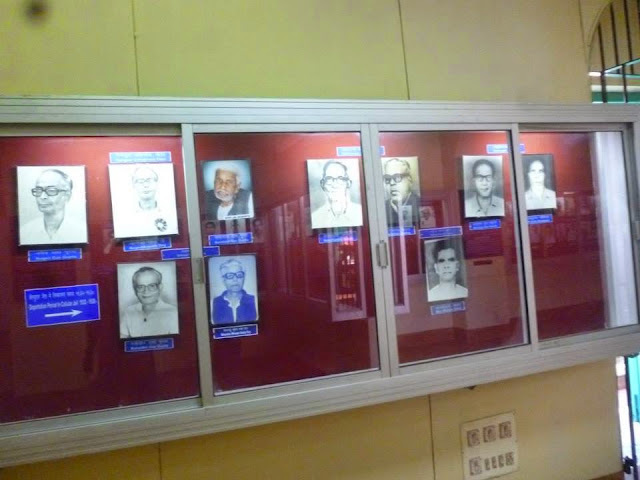 I really felt proud to see it.It proves beyond any doubt the contribution made by the Bengalis in freedom struggle. You don't even need to read even History books to understand this. Hardly any prisoner is a Brahmin - Mukherjee or Bannerjee in an otherwise representation from all castes of Bengalis ! So I pulled Mohua's leg because of this ! The only beach in Port Blair probably is Corbyn's Cove . According to my sister's friend "After Radhanagar, the crowded and dirty Corbyn’s Cove falls woefully short, despite its water-skiing options. 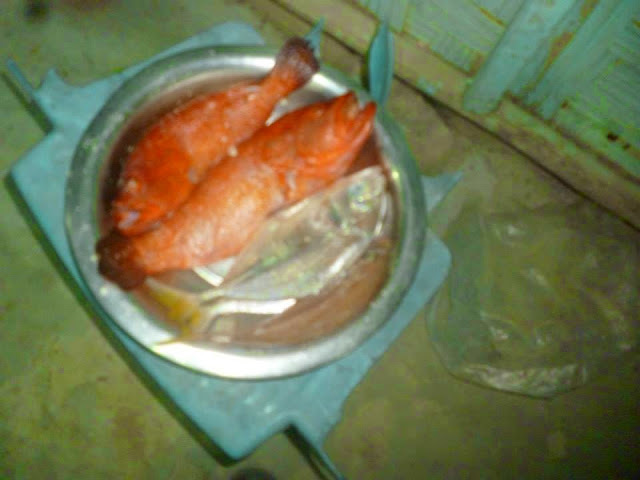 Chidiya Tapu, 28km from Port Blair, was better but still no match "
Chidiya Tapu is however not in Port Blair. 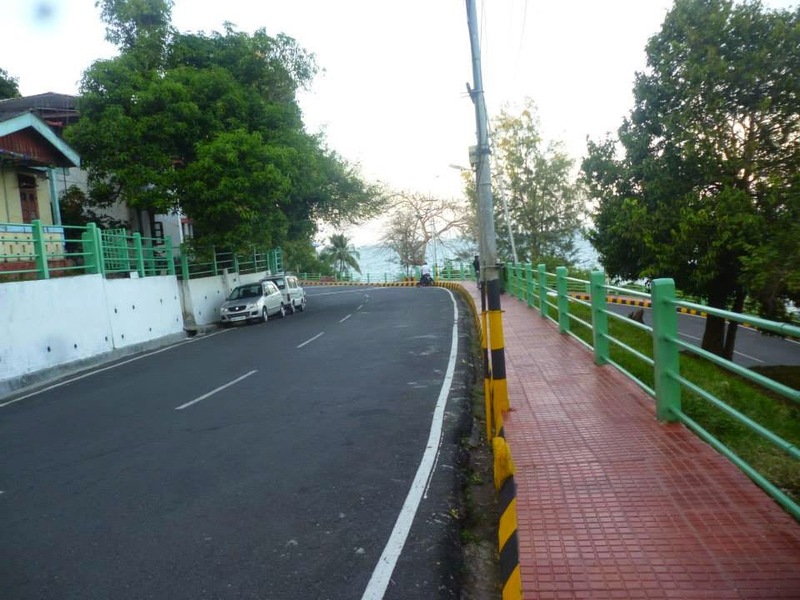 One can go there by bus.Buses run several times per day from Port Blair and take 1.5 hours.The last bus that leaves the STS Bus Terminal is at 5pm and once it reaches Chiriya Tapu, the same will return to Port Blair. Chiriya Tapu is a very good sunset point. Diglipur - 8 hrs. If you're going further than Rangat the road is somewhat bumpy, so it's recommended not to get seat number greater than 20 (as this is over or behind the rear axle). Mahatma Gandhi Marine National Park - A small but extremely beautiful island in the Mahatma Gandhi Marine National Park is Jolly Buoy . 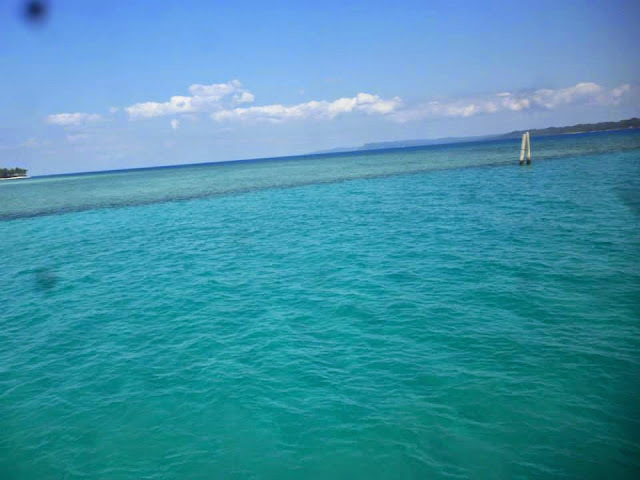 It is the best place for Snorkeling in the entire Andaman Islands. One has to first reach Wandoor by Road and then take a Jetty. Permit must be taken 1 day in advance form The IP&T Department Building. Baratang Island - Mud volcano, limestone caves, and Parrot Island, 2.5 hrs by bus and ferry from Port Blair. On your way to Baratang you can see local Jarwa tribals. However, the tribals have been moved to a separate island and there's not much to see. There are 2 Jetty’s in Port Blair. Phoenix Bay Jetty to go to Havelock, Neil Island and other far destinations. Rajiv Gandhi Water Sports Complex near Celluar Jail to take smaller ferries to Ross Island, North Bay and Viper Island. 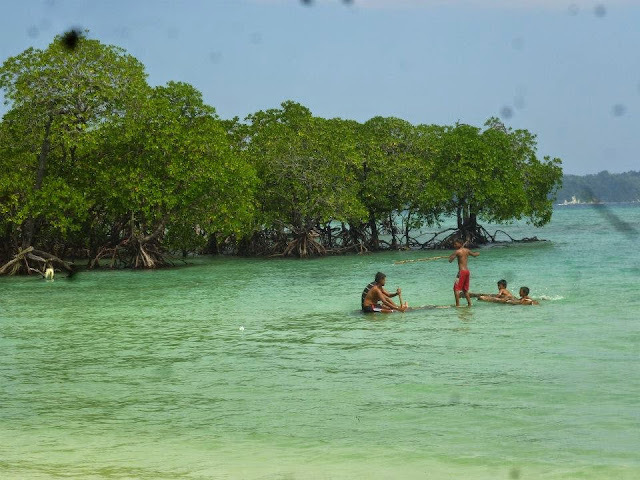 North Bay Island - Although facilities for Snorkeling, Scuba Diving and Sea Walk are available here, but the Corals are mostly dead and the marine life is scanty compared to other Islands like Havelock or Jolly Buoy. 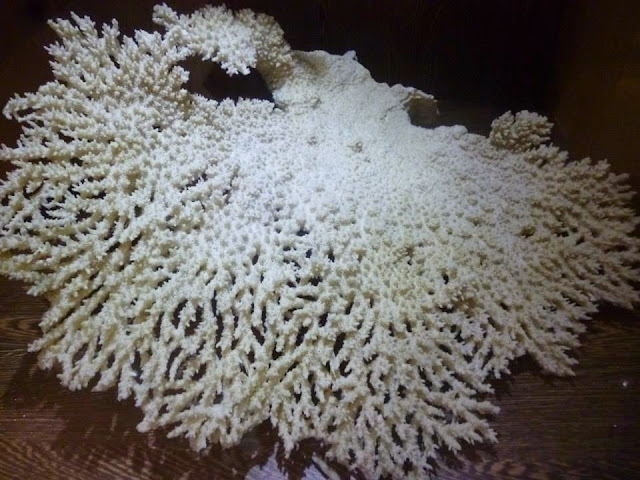 You can also see Corals in glass boat. 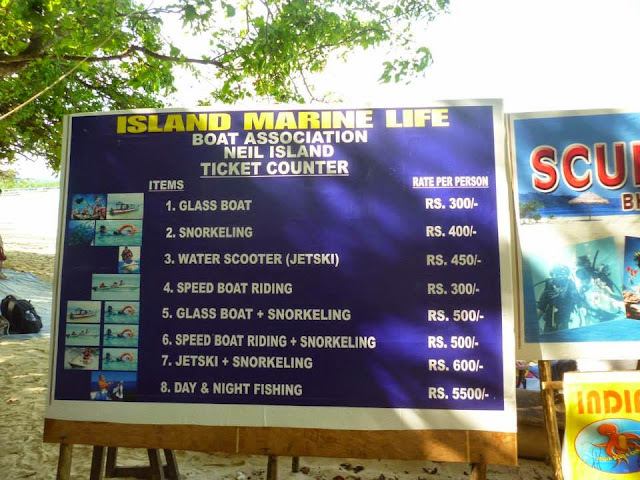 They charge around ₹300 per head for snorkel and ₹200 per head for glass boat. Barren Island is a volcano island and the only volcano in India. Day trips can be arranged from Port Blair - however it is not possible to set foot on the island, only to view it from the boat. Little Andaman. Several times weekly from Hut Bay, takes 8 hours.